Here is what my shortcuts properties target line looks like. Notice the addition of -dx9 to default entry. 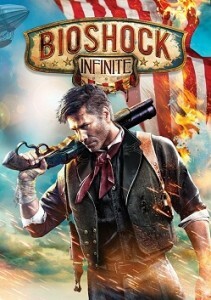 This includes encountering the annoying BioShock Infinite black screen on launch. Try the below solutions! Intense games need to be played with sound. Note that these fixes can help if you have a weird static, fuzz, or crackling noise too. Stuttering? Lagging? Upgrade your damn computer! Kidding. Mostly. If your computer is awful, it would make sense as to why you are lagging. But assuming that is not the case, read on! This should help with screen tearing too. Anyway, that’s all the fixes we have for now! Check back again for some new ones. This entry was posted	on Thursday, March 28th, 2013 at 11:42 PM	and is filed under Games. You can follow any responses to this entry through the RSS 2.0 feed. You can leave a response, or trackback from your own site.